Life can be hectic. For balance, many people seek to create an atmosphere of lightness and calm in their home. One way to achieve this is with white floors. 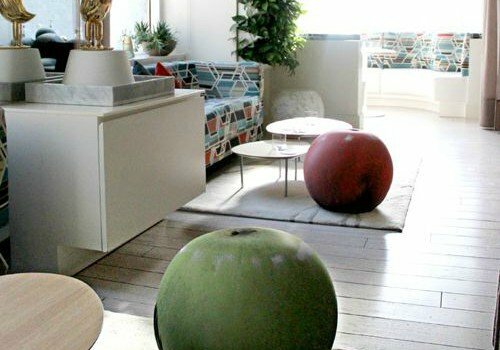 White floors can bring a clean, restful foundation to a wide range of decor styles. But what material will work best in your home? We explore 10 kinds of white floors available to help you decide. Ideal for both traditional and modern decors, Rustic Ivory Wide Plank from Ambient Bamboo Floors adds an elegant and warm touch to any room. 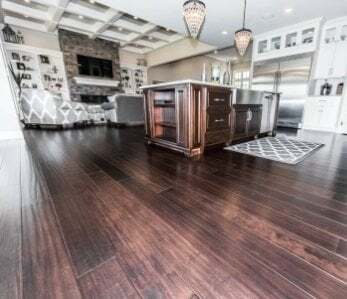 Plus, it’s 3 times harder than any other hardwood, made from a rapidly renewable resource, and warm underfoot, so you’ll be helping the environment and adding a gorgeous natural product to your home at the same time. Use its “almost” white color blend with neutral interiors. Or, use it to create compelling contrast in rooms dominated by bright or dark colors. It can soften modern decor or bring a gentle edge to traditional designs, especially those in the vein of French cottages. Tongue and groove makes it easy and quick to install. 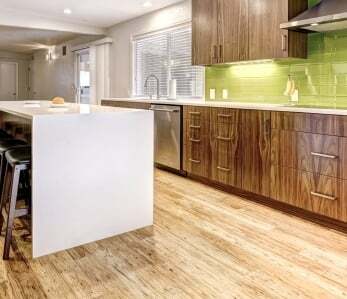 And, despite the light color, these woven bamboo planks are easy to keep clean. 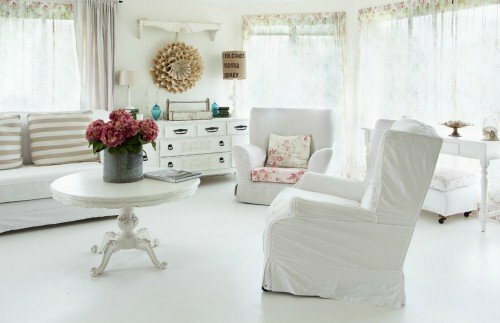 White floors made from painted wood often can create a cottage-y or eclectic vibe. It’s less expensive and labor-intensive, compared to refinishing. It won’t repair scratches, dents, and other scars but it will hide them. Remove any wax or gloss. Use a square of 150-grit sandpaper to rough the surface. Clean the floor first with a vacuum then a damp mop. Let it dry completely. With a brush, cut in the edges. With a roller or brush, apply a thin coat of paint over the entire floor, working your way toward a door. Let it dry for 24 hours. For a smooth finish, lightly sand the floor with 220-grit sandpaper. This will smooth out the grain and create a sleeker finish. Vacuum, damp-mop, and let dry. Apply a second thin coat of paint. Let it dry for at least 24 hours. 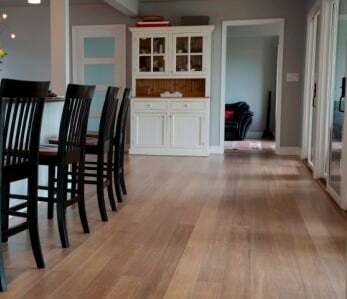 Cost savings is the largest immediate advantage of painted wood floors. But the paint will wear unevenly, making high-traffic spots noticeable in as few as 3 years. 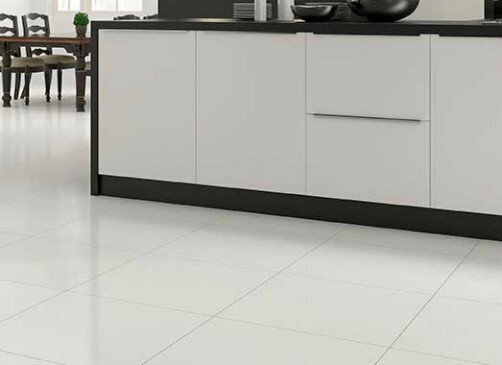 To create white floors with vinyl, you need to first decide if you’ll use vinyl sheets or tiles. 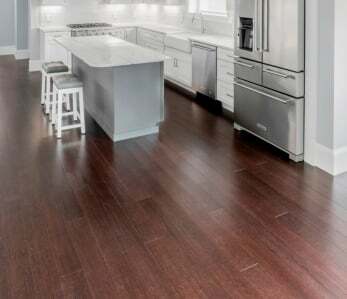 Both forms are an inexpensive flooring option commonly found in kitchens and bathrooms. Vinyl is easy to clean up and doesn’t require special maintenance. But it’s easily cut by sharp objects and dented by heavy furniture or appliances. Vinyl also fades in direct sunlight and can develop a worn-out look. This is true even with white floors. When it comes to installing vinyl, tiles are easier to manage that sheets. But both require precision to avoid bumps. Either way, this material can help dampened sound in rooms with high ceilings, lots of windows, or many hard surfaces. Ceramic is clay, hardened at high heat. Once glazed, it is highly resistant to water and stains, which makes it a popular choice in kitchens and bathrooms. Most people opt for ceramic when they want a vibrant floor or one with intricate embedded designs. 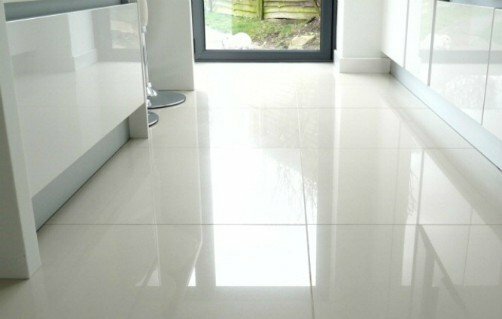 But ceramic tile can also be used to create stunning white floors. Ceramic is durable. 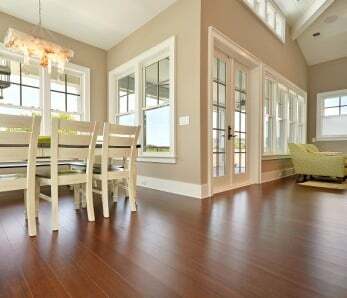 A well-laid floor can last up to 20 years without the need for touch-ups. Washing it is easy. But be careful using hard items like dishes and smartphones; they’re likely to break if dropped on ceramic. Kaolinite, a kind of clay, is the main raw material in porcelain. But unlike ceramic, the clay is blended with other raw materials such as glass, quartz, and alabaster. Porcelain is fired in extreme heat. Afterward, it’s non-porous and resistant to water without glazing. It can be painted with rich colors or made pure white. You’ll often see it in rooms with modern decor because of its sleek finish and aesthetic. Marble floors have been enjoyed for centuries by people who seek classic luxury. With this material, it’s impossible to get pure white floors (unless you have an unlimited budget and lots of time) because of the natural veins that run through the rock. 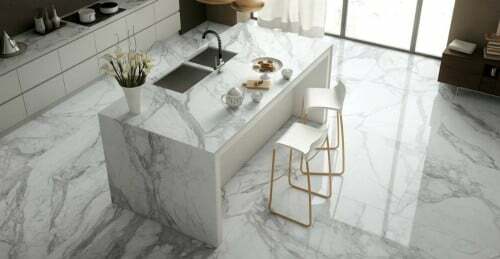 When buying marble flooring, make sure all tiles or slabs come from the same batch. Each marble quarry yields different colors from white to gray to pink. Further, vein patterns will vary, depending on the location within the quarry. Want to see a marble quarry? Check out this short video produced by The New York Times. Maintaining marble floors isn’t difficult but they should be resealed every 3-5 years to remain water-resistant. 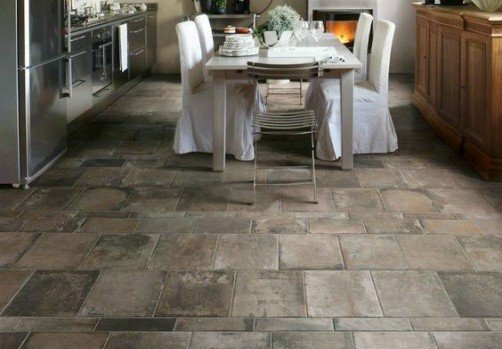 There isn’t a more natural looking floor than one made of stone. Favored in homes where indoor and outdoor spaces flow into other, stone is a durable choice. It’s ideal for people with allergies since it can’t hold dust and pet hair. There is a timeless beauty to stone that can add to resale value as well as everyday enjoyment. If you’re creating an edgy aesthetic or looking to spruce up a basement without spending a lot of money, there’s nothing like a concrete floor painted white. With a roller, apply a coat of primer. Allow to dry then repeat. Using a roller or paint compressor, apply a coat of epoxy paint. Allow to dry then repeat. In the end, you’ll have a distinct floor that’s doesn’t collect dust and dander. And, if you ever decide you no longer want a white floor, repainting isn’t an overwhelming project. Yes, rubber. Whether you get it a sheet, tiles, or have it poured, rubber can be practical and attractive flooring option. It’s most often found in industrial and commercial settings. Yet, some homeowners find its shock-absorbency beneficial in playrooms, kitchens, and bathrooms. Although easy to clean after spills, rubber that is worn or not well-sealed can retain the color of natural and artificial coloring. Think wine, tomato sauce, and spinach smoothies. 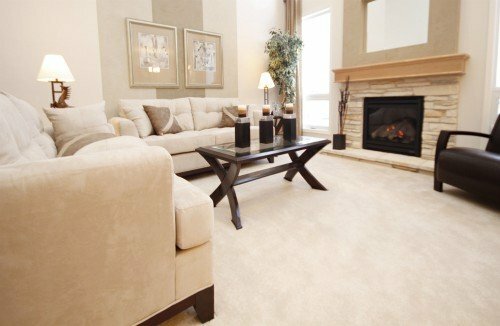 White carpeted floors can contribute to a soft, cozy, elegant style. But they generally aren’t the ideal choice for busy households or those with pets. Carpet is without question the warmest material to have underfoot. The trick is keeping it clean and looking fresh over the years. The best way to retain the value and comfort of carpeted floors is to have them professionally cleaned once a year. Homeowners with children and/or pets often increase that to twice a year. Are White Floors For You? 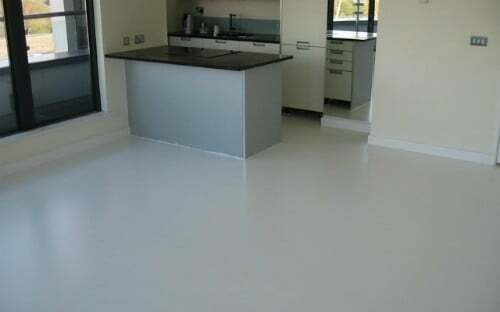 If the idea of having a white floor makes you nervous about spills and evidence of ordinary wear and tear, don’t worry. With so many materials to choose from, you’re bound to find one that suits your budget and lifestyle. Plus, there’s no rule that says you have to have white flooring in every room. 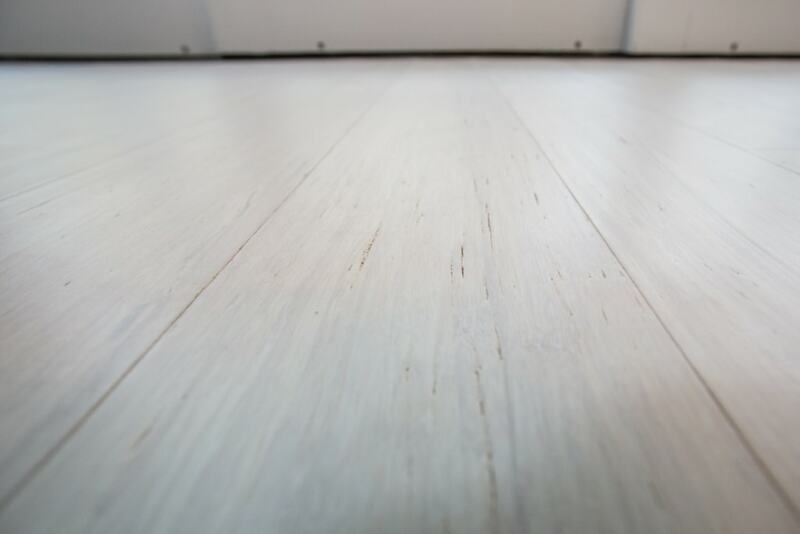 At Ambient, we see people order other kinds of bamboo flooring along with our rustic ivory product. today to learn more.